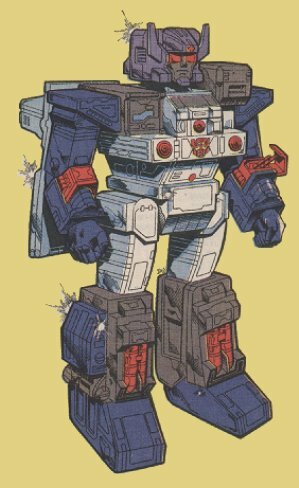 Profile: Valiant, courageous, powerful beyond measure, Fortress Maximus is a warrior without compare, but one whose most fervent wish is never to have to fight again. All his early life, Fortress Maximus trained as an architect, becoming the creator of many of Cybertron's proudest monuments. With his ability to transform into vast construction bases, many of his creations were crafted by his own hand. So Fortress Maximus learned to build, not destroy. When war came, he did not hesitate to turn his gifts to the ways of combat, adapting one construction base into a repair bay, the other into a battle station. But as the war spread and he saw his constructions tumble and wall with countless lives lost in the process, he began to see how pointless and counter-productive battle was. He began to fight with only one aim in mind - to bring an end to the senseless conflict. He would fight, but only out of necessity, only to save other lives. Drawing inspiration from Optimus Prime, Fortress Maximus carried on his noble work after Optimus disappeared, assuming Prime's mantle of Autobot leader. But as the war dragged on, so Fortress Maximus's ideals dulled, his purpose lost in one battle after another. Realizing he was losing his very self, Fortress Maximus and a group of Autobots left Cybertron, bound for the planet Nebulos, a world where they could live in peace. But the Decepticons followed, bringing the war with them. To better combat the Decepticons and convince the Nebulans of their honest intent, Fortress Maximus removed his head, letting the Nebulan leader Galen replace it. Galen's body was bio-engineered to combine with an intermediary form and transform into a facsimile of Fortress Maximus's proud visage. Through his mind-link with Galen, Fortress Maximus rediscovered his purpose. The battle would not be won by turning his back on it. So he returned to the war, fighting once more, every battle a small step towards his ultimate goal... the end of all hostilities. When Galen was killed, the human Spike Witwicky took over as Fortress Maximus's binary-bonded partner. Spike, a college student, had no long term plans to continue in this role, and eventually quit. But as he has continued to find out, the binary bonding goes deep indeed and his own courage and commitment will be tested to the full. Abilities: In both robot and battle station mode, Fortress Maximus is a walking armory. Retractable pulse cannons (emitting a strong ion beam capable of disrupting and incapacitating internal circuits), twin automatic machine gun batteries (wrist mounted in robot mode), twin laser-guided mortars (in lower legs, robot mode), dual laser blasters (with a heat-seeking target lock system) and a fusion-powered photon rifle make his firepower second to none. His battle station is fully equipped with communication, detection and radar equipment, while his repair bay has extensive re-fit facilities for almost any Transformer and a wide range of spare parts. 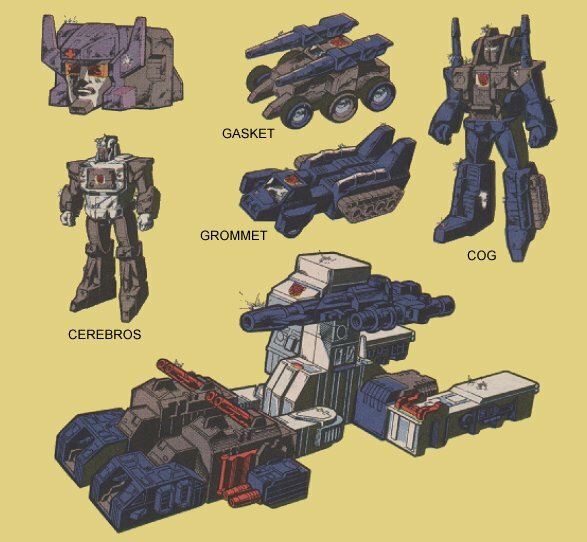 From either repair bay or battle station Fortress Maximus can operate two remote controlled vehicles, Gasket and Grommet, using them to supply instant battleground first aid/repairs or as offensive/defensive combat units. When in robot mode, Gasket and Grommet combine to form the radio controlled warrior/mechanic, Cog. Fortress Maximus's head transforms into a robot form called Cerebros, which is controlled entirely by his binary-bonded partner. Despite his size, Fortress Maximus is both very strong and very fast. Though seemingly awkward, his bulky configuration moves with well oiled ease. His greatest asset, though, is his vast intellect and capacity for instant tactical decisions. To him, crafting an attack is like blueprinting a structure and it's almost second nature. 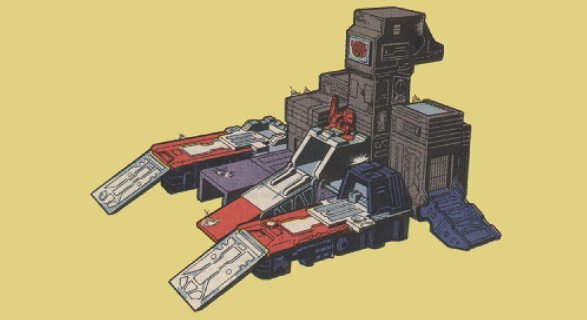 Weaknesses: The many parts of Fortress Maximus, each requiring a portion of his concentration, sometimes leave the whole vulnerable to attack. When guiding Gasket and Grommet through a battlefield, he relies almost totally on automated defense systems to safeguard him from attack. If incapacitated in robot mode, Fortress Maximus has no choice but to utilize his second robot form, the much smaller and infinitely more vulnerable Cog. Beyond these slight problems, Fortress Maximus has no known weaknesses.